We often pop to the nearby county town of Haverfordwest (known to us locals as “Harford”). Sometimes we combine our odd jobs and bits of shopping we need to do with a fun play in the park and an explore of Haverfordwest Castle too. This is just what we did last Sunday. We parked on the road alongside Morrisons and the park (there is also a Pay and Display car park on Perrots Road, SA61 2JP). We ate a quick picnic on the park bench before playing. It’s so lovely to have these sunny days with no need for warm coats! It’s a very pretty area overlooking the Western Cleddau River. We walked on to the spider web climbing frame. It’s aimed at older kids but as the girls have had plenty of practice on the smaller spider web in our local park, they had no trouble scrambling up this higher version. This walk then leads you passed the Bardic Stone Circle which was placed here in 1972 when the Eisteddfod took place in Haverfordwest. Another close stone circle to note is the Gorsedd Circle in St David’s Airfield which was placed in 2002 (I have been meaning to write a post up about here for ages). My favourite thing about Haverfordwest is you can see the Castle from almost anywhere you drive and stand in the town centre. As young children learning words, my kids have always loved to shout “castle” each time they spotted it. Following the river along, we admired the bridge and reflections in the river. Slowly, we made our way closer to the Castle. “Coffee 1” to the right of the castle was a pub for many years. It seems strange to me now thinking about it as a coffee shop/cafe but of course I understand that business need to change to keep the custom. Rebecca in front of the Riverside Market which will also be going through big changes soon. Still getting closer, we pass over the river to get onto the right side of town. Sadly the family department store pictured closed a few years ago. We continued to the square in Haverfordwest, then turned right at the alley behind The 99p Store (which used to be Woolworths). This walk then takes you up some quite steep but manageable steps. For those with mobility problems, you can actually drive up close to the castle and park in The Castle Car park. The castle is owned and maintained by Pembrokeshire County Council. It is managed by Haverfordwest Town Museum. There is always open access to the castle but it is more informative to visit when the museum is open too. As we visited on a Sunday it was closed, but we had fun exploring anyway and it is free. The castle was originally a 12th Century Fortress. Of the large outer ward only two turrets survive, the inner ward has a high curtain wall, four towers and two fine ranges of buildings. Most of Haverfordwest Castle, as it is seen today, dated from the time of Queen Eleanor, wife of Edward I, or Edward Longshanks. There are great views of Haverfordwest from the castle too. We attempted a family picture but this happened! No “Me and Mine” project for us this month! Haverfordwest Castle on it’s own isn’t a full day out but if you add on the walk, a picnic and a play in the park then it can entertain the kids all day and all for free apart from the picnic food. It’s worthwhile looking for free events here too. We have been to reenactments and archaeology digs in the past. On our way out we stopped to look at the ancient cannon. This was actually dredged up in our home town of Milford Haven and presented to the County of Pembroke by Henry Owen of Poyston possibly in the lated 1800’s/early 1900’s. Leaving the castle we were greeted with the sight of a Medieval Church, Saint Martin of Tours. We walked back through the tunnels of wall art. It’s such a shame that the castle, princess, knight and dragon have been partly sprayed over. We walked back past the spider web for more playing and climbing. Then past the Eisteddfod stones and for another play in the park. 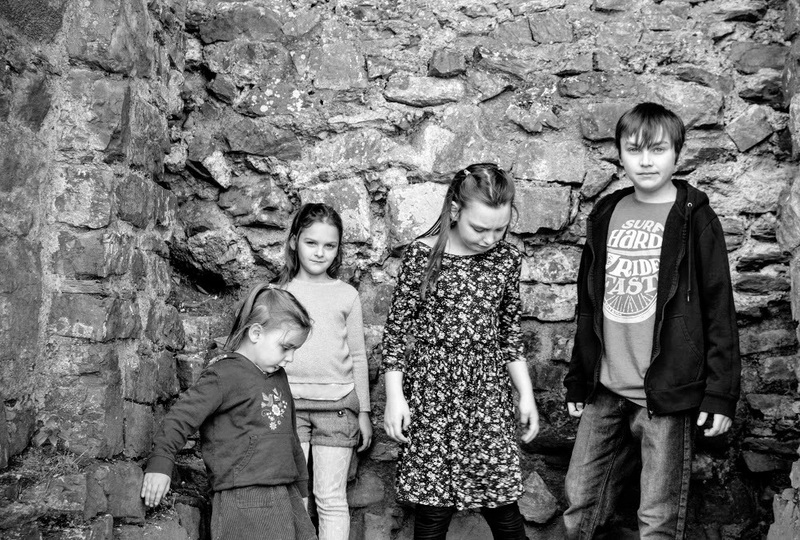 We managed to take lots of our “Siblings” photos at the castle as it provided a lovely backdrop. Here is some information in case you get to visit when the museum is also open- still a good price for a day out! We also love days out at Pembroke Castle, Carew Castle, Llawhaden Castle and Manorbier Castle in Pembrokeshire. Cardiff Castle is a great day out too. For rainy days we also have a Castle Craft that is fun to make. Which castles do you love to visit?